Last Saturday night, as I was planning to make dinner, I noticed that I had some bananas that were spotting and starting to go bad. Usually if I have one or two bananas going bad, I'll make Oven-Baked Banana French Toast, Banana Cinnamon Oatmeal, or Banana Whole Wheat Pancakes. But this time I had 6, count 'em, 6 bananas to use up. Too many for any of those recipes. So I decided to make some banana fritters! Banana fritters are sort of like pancakes, but have less batter and more bananas. And they are fried, not just cooked in a greased skillet. 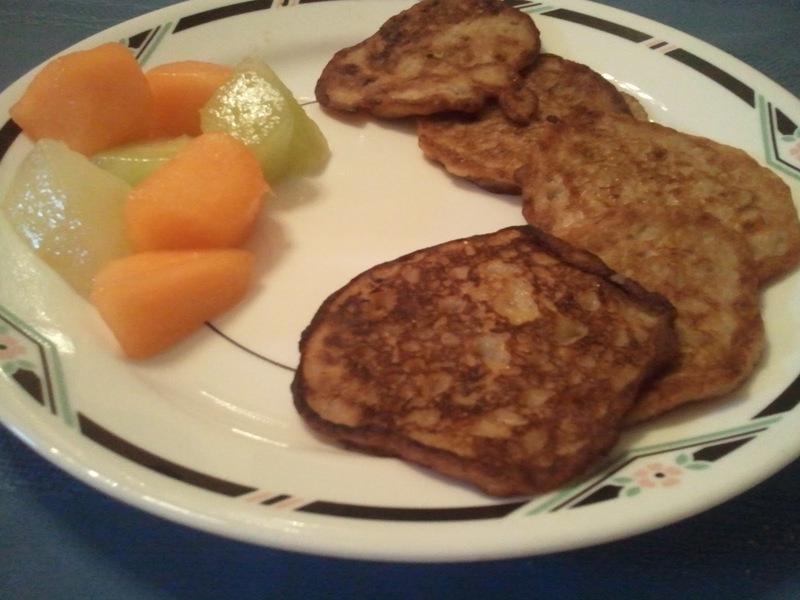 I served the fritters with some leftover honeydew and cantaloupe, and because this recipe is a little low on protein, I made sure the kids each had a big glass of milk with it. In a large bowl, mash the bananas. Add the sugar, eggs, and flour, and mix until the ingredients are incorporated. In a large skillet, heat the oil over medium heat. Add the batter in spoonfuls - fritters should be about 2-3 inches in diameter. Cook until the edges are browned. Flip the fritters over and cook the other side until browned. Remove to a plate covered with paper toweling to allow oil to be absorbed. Place fritters on a metal baking sheet in a 250 degree oven until ready to serve. Repeat until all of the batter is used up, adding oil to the skillet as necessary. Love that there is minimal flour! Can't wait to try this on a Sunday morning. I posted an unbelievably easy and yummy recipe for Party Ranch Dip! Wow ! the recipe is so easy to make.I will definitely make that now.Thanks for sharing this easy-looking recipe. Those look so good! Almost like banana pancakes. Mmmm. What a great idea for a link party, I need to search through all these links. I'm hosting a fall food link party today, we'd love to see you there! You're really tempting me with these fritters! I love fritters of any kind with banana and eggplant being my favorites. Thanks for this sharing this recipe! Thanks for being such a great host as well! Have a marvelous weekend. Hi All! I linked a post I wrote on "Join a Buying Club". I included what a buying club is, how they work and how to find one. It's been a time-, money-, and life-saver for me!!! I never heard of banana fritters but I suppose they would be good. Thank you so much for the recipe and thank you for hosting a party. Happy Thursday! I'm sharing a recipe for Minty Chocolate Ice Cream with Dark Chocolate Freckles! It is cheaper to make your own ice cream, and so much healthier because you get to control the ingredients. This ice cream is better than any mint-chocolate chip I've ever had. Thanks for hosting! I bet kids do love this recipe, and I think I might too! I have never had a banana fritter. This recipe sounds great. Thank you for sharing at the Thursday favorite things hop. Big hugs! I love your Banana Fritters! Enjoy your weekend and thank you so much for sharing with Full Plate Thursday. Yum, anything banana sounds good to me!! Thanks for sharing at Foodtastic Friday! What a great idea for breakfast! I cannot wait to make this. We are having a great giveaway this week. 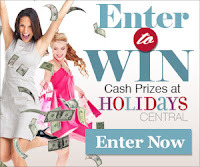 Come visit for a chance to win. Wow such a simple recipe :) and I just happen to have an overload of bananas! Ran across you page through the link rink today. We have a few spotty bananas sitting in our kitchen right now and you recipe sounds Yummy and so simple. Can't wait to try it. I have not tried to use bananas in fritters - but in muffins, pancakes,etc, and these have less flour.